Either you pay good money for a platform one, or you build one yourself, in Excel. Like literally, what if I told you that right here and now you can download a GANTT chart template for Excel that actually works? This is not only a Gantt chart – this is an all-in-one solution to plan and execute your project while keeping an eye on all costs as you progress. The sheet is available in two versions. Select yours now! Upgrade from the Professional to the Extended plan. This is the starting point: here you can outline your tasks and decide how much they will take. See the multi-coloured bar in the WP line? That is a heatmap telling you how much workload you have at the same time. In other words, this tells you how many tasks you have going on in a single work package in parallel, and therefore how heavy the workload is going to be. The line at the bottom tells you how heavy or light the workload is going to be based on what you are working on. If you group all the rows, you’ll have an indication of the workload per work package or for the whole project. Part 2: hours allocation according to the Gantt chart. Once you have planned how long your project will take, you can tell Excel how many hours or days your staff (1, 2, 3 people) needs to work on any given task. Say one task needs 1 month of time with 4 people working on it full time (4 person-months). You can tell my Gantt template both of those values, and use them together in the same file. Once you established the Gantt and the workload. You can use this Excel chart to allocate the hours among your staff. Say, for example, that you need to split 100 hours: you can give 10 to the CEO with an hourly rate of 150€ and 90 to a consultant with a rate of 87€. This Excel sheet allows you to precisely determine the costs of who is going to work where. 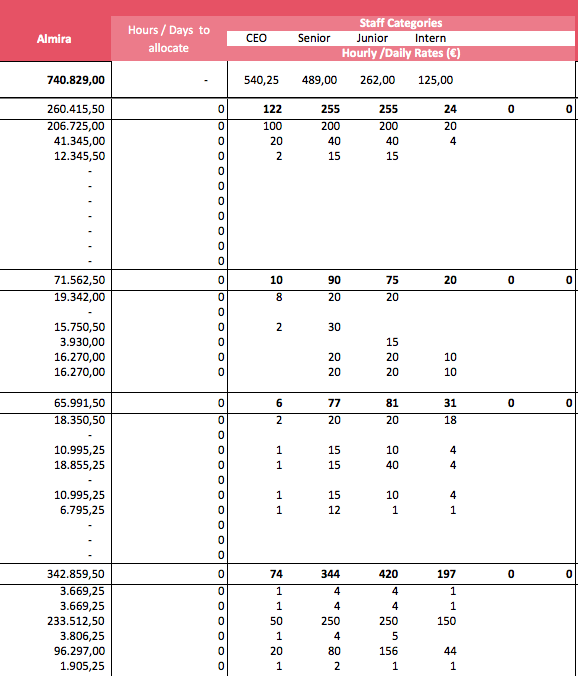 And if you just need an overview of the total budget per partner, you can group the columns and obtain this view. For any other cost that you need to add on to your staff costs (Travel, Subcontract, Other), you have three dedicated worksheets in the Gantt chart template. All of them are coordinated with the names of the partners and of the work packages. The last sheet is a table summarising all results. This is the single most budget integrated Gantt chart available for Excel in its category, choose your version right now.